Coverage of the impact of U.S. regulations, status of the U.S. environment, continuing problems, economic costs, and cost-benefit issues further increases the value of this source to environmental engineers and scientists working for the EPA, state regulatory agencies, or consulting engineering firms. This guide is also a vital reference for environmentalists working with advocacy groups, and environmental or process engineers in industry. About the Author NANCY J. SELL, is Professor of Natural and Applied Sciences at the University of Wisconsin-- Green Bay, as well as President of N.J. Sell & Associates, an engineering consulting firm. She is a member of TAPPI, ASTM, National Society of Professional Engineers, the American Chemical Society, and other professional organizations. Among her nearly 75 published efforts are two other books and numerous journal articles, technical papers, reports, teaching manuals, and chapters in technical books and encyclopedias. Dr. Sell is co-holder of two patents and has made numerous presentations at research and technical symposia. She earned her Ph.D. in Chemical Physics at Northwestern University and a M.S. at the Institute of Paper Chemistry. 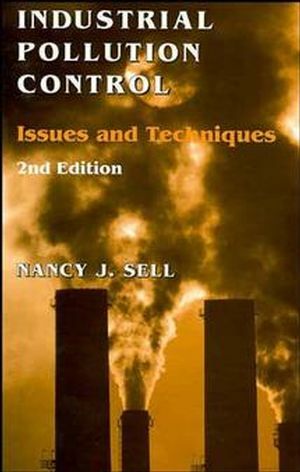 Methods for Air Pollution Control. Methods for Water Pollution Control. Solid and Hazardous Waste Disposal.